Senior Sarah Gottlieb moderated a panel of three autistic students: sophomore Aaron Herman, senior Rachel Bennett and sophomore Justin Robbins. On April 11, senior Rachel Bennett and sophomores Justin Robbins and Aaron Herman spoke about having autism at Tufts in a panel hosted by the Coalition for Autism Support (CAST). 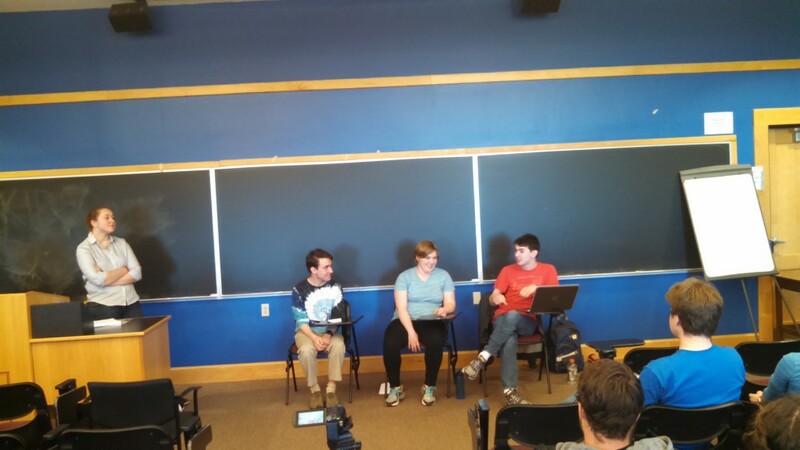 The panel, entitled “But You Seem So Normal’: A Panel about Autism at Tufts,” was moderated by CAST member Sarah Gottlieb, who identified herself as “neurotypical,” or someone without a cognitive impairment. Bennett, Robbins and Herman, core members and founders of CAST, each talked about their personal experiences before opening up the floor to questions from the audience of about 25 students. Herman, who spoke first, said that the title of the event resonated with him, as he has navigated the boundaries between seeming “normal” and being autistic. “I’m dreaming of a world where I can build meaningful, mutually beneficial relationships with the people around me, while also color-coding maps of the United States for density for fun,” he said. Herman said that improving social skills can be difficult, but that ultimately the process has helped him in forming relationships without conforming. “There’s a certain degree to which neurotypicals have a responsibility to accommodate us,” he said. Bennett said she was diagnosed with Autism Spectrum Disorder (ASD) her sophomore year at Tufts. She spoke to the importance of emotional honesty for everyone, but especially for people with autism who may have more trouble picking up on social cues. She said that she faces constant anxiety about whether she had accidentally hurt someone’s feelings without realizing it. Bennett maintained, however, that she tries not to feel guilty for the mistakes she makes because of her autism. Robbins said that he was diagnosed with ASD his junior year of high school, the same year he came out as gay. He remembered that he began to become aware of his social isolation and awkwardness with his friends at school. “I started feeling paranoid — was there something wrong with me that was painfully obvious to everyone other than myself?” he said. He brought up his concerns with his therapist, who entered him into testing for Asperger’s Syndrome. Asperger’s has since been removed from the Fifth Diagnostic and Statistical Manual (DSM-5), the American Psychological Association’s diagnostic tool, in favor of the more broadly defined ASD. Herman agreed, preferring identity-first language. “I’m not a person with some autism on the side,” Herman added. Gottlieb asked the panelists if they had ever faced ignorance or intolerance when it came to their autism at Tufts. Gottlieb then turned the questions over to the audience, and the panelists discussed what they believed was the most common misconception about autism. “The idea that autism is empirically bad — it’s not true,” Robbins said. To wrap up, the panelists shared one thing they hoped the Tufts community would keep in mind.